Weddings are joyous occasions, not only for the lucky couple but also for the friends and family that join in on the celebration. But for those friends and family, the festivities come with a price tag. 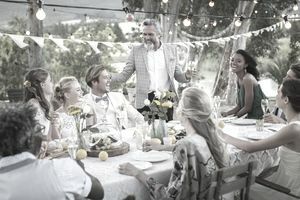 According to a study from the Knot, the average wedding guest spends over $800, including travel, clothing, and a gift. That figure goes up substantially for members of the wedding party, pushing the total amount spent well over $1000. If you expect to be a guest at one or more weddings this season, you may be just as excited to be invited to the couple’s special day as you are worried about how to afford it. Here are some tips to help you navigate wedding season without taking out a small loan or coming off as a complete cheapskate. If you are fielding multiple invites, be selective about which weddings to attend. Consider your relationship with the bride or groom. For example, you might choose to attend the wedding of your co-worker who has been your lunch partner and office confidant for the past five years over the wedding of your second cousin whom you haven’t seen since you were six. Chances are high you may be expected to travel to one or more of the weddings. With guests spending an average of $643 on travel and accommodations, if going to an out-of-state or destination wedding means overextending yourself financially, you may need to draw a line in the sand and stick to local weddings. If you do choose to travel, seek ways to reduce your spending such as booking early, using airline miles, or looking for packages that combine flights and accommodations. Additional ways to save include using the couple’s hotel room block, sharing a room, or going in with a group on an Airbnb which also allows you to save on meals. If your travel involves extended driving or the need to rent a car, split the costs of gas or the rental with other guests. Maximize your budget by going in on a group gift. When giving cash or purchasing a present on your own, you may be tempted to overspend to give a more substantial gift. By going in with other guests, you can stretch your budget and get the couple one of their big-ticket items. Forty-eight percent of wedding guests buy new clothes, spending $81 on average. If you plan to get something new, maximize that purchase by using the outfit for the entire season. Ladies can use different shoes and accessories to update their look, and guys can easily get away with wearing the same suit by switching up the shirt and tie. Another way to save on clothing is to check out sites like Rent the Runway and The Black Tux to “borrow” outfits instead of buying. Sometimes you just have to say “no”—and that is okay. Remember these are invitations, not demands. There are many valid reasons to decline a wedding invitation—and not having the money is one of them. This is especially the case if you’re asked to be a member of the wedding party. A CouponCabin survey found that 22 percent of American adults declined being in a bridal party because of the expense. If attending a wedding is outside of your ability financially, gracefully decline the invite and consider sending a gift anyway. At $118, the average amount spent on a wedding gift is a lot more budget-friendly than taking on the total costs of attending a wedding. Following these tips requires the willingness to step outside of social norms. But if you are committed to being financially responsible, challenging what’s acceptable is exactly what you need to do. The bottom line is you're the one paying your credit card bill, so resist any pressure to spend more than you are able to. Be confident in how you decide to approach wedding season and be upfront if necessary with your choices, including the reason you are declining any invitations. The bride and groom, assuming they are true friends or family, will understand.